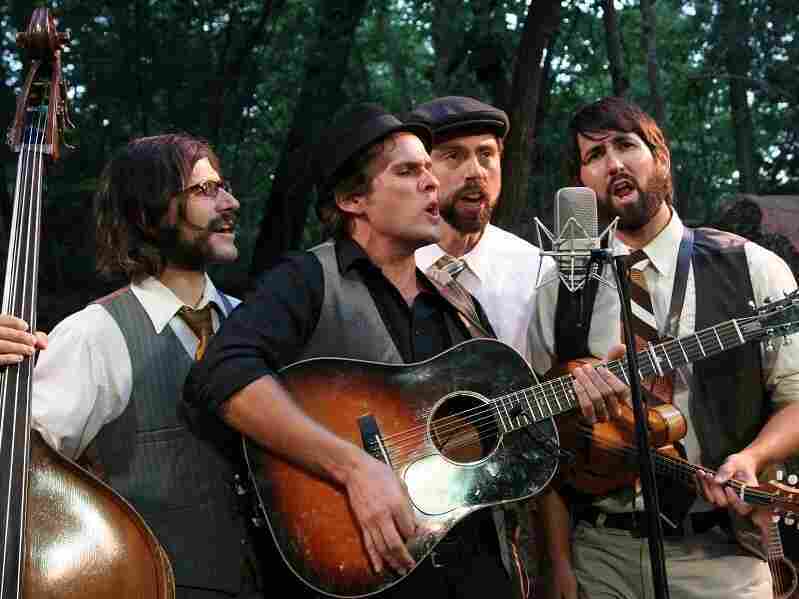 The Steel Wheels: Americana, Made By Hand The Virginia band embraces a hand-hewn quality in its music, which is a collection of American sounds reaching from mountains to fields. A heavy hymn, "Rain in the Valley" is sparse and dense at once, carried by four interlocking voices. A heavy hymn, "Rain in the Valley" is sparse and dense at once, carried by The Steel Wheels' four interlocking voices. Song: "Rain in the Valley"
The Harrisonburg, Va., band The Steel Wheels embraces a hand-hewn quality in its music, which is a collection of American sounds reaching from mountains to fields. The group's first album, Red Wing, showed more of the grain and rougher edges, but Lay Down, Lay Low has been buffed to a high polish. The new album is stronger in its use of the band's vocal talents, reminiscent of the four-part singing of the Mennonite communities where several of them once lived. A heavy hymn, "Rain in the Valley" is sparse and dense all at once, carried by the four voices of band members Trent Wagler (also the song's author), Jay Lapp, Brian Dickel and Eric Brubaker, with only a stomp box and bell-encrusted rhythm stick to pound and jangle in the background. Brubaker provides the firm ground with an impressive bass voice, full of ringing declaration. Wagler is the clarion call, shouting both a wish and warning to the heavens: "Ain't no water gonna bring me down." Twisting and churning, "Tell what the water couldn't take from me" passes from voice to voice, in waves of overlapping defiance and fear, drenching the whole song in sound, and leaving listeners hoping to get washed away.